While stopping by the +The Herbal Center, a Denver Dispensary on Broadway I came aross this MMJ innovation in the blossoming Colorado cannabis industry. After requesting an eighth of White Shark medical marijuana, a caregiver onsite at the time handed me my cannabis in a Dragon Chewer medical marijuana grinder jar. 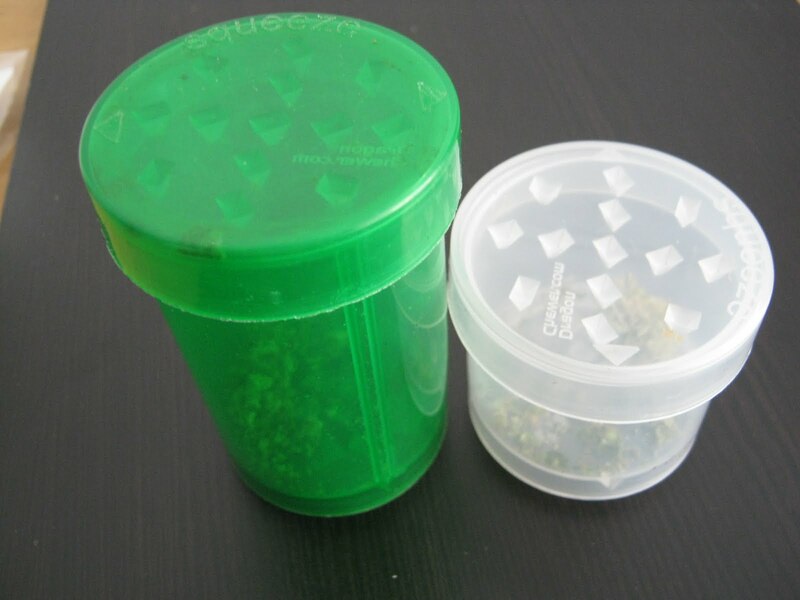 At first site the Dragon Chewer bud grinder container appears no different than the standard, plastic squeeze top cannabis jars used by most medical marijuana dispensaries in Colorado. Closer examination of the bud grinder jar reveals that the Dragon Chewer cannabis container is in fact much more than a simple plastic, squeez-top medical marijuana jar. In fact, with the introduction of the Dragon Chewer medical marijuana grind container, the days of paying $40+ for a quality stash jar are over. As you can see in the pictures, the side of the pop top that faces the inside the Dragon Chewer stash jar has jagged teeth. Similarly, the bottom of the jar is lined with grinding devices. What look likes a normal prescription medical marijuana jar becomes a quality grinder stash jar with Dragon Chewer. And the Dragon Chewer marijuana bud grinder could not be easier to use. Open the squeeze top lid. Place a nug or nugs on the inside of the lid. Attach the inside of the lid, with the nug in it, to the bottom of the jar. Hold the cylinder with one and the lid with the other hand. Twist the lid and jar back and forth three to four times. And that's it. After the utilizing the Dragon Chewer marijuana container you're left with fresh marijuana ground to perfection for packing a bowl or rolli a joint or blunt. The Dragon Chewer is truly a great innovation for the exploding medical marijuana industry. Simple, efficient, and cost effective.